Unmukt Bharat Chand Thakur, popularly known as Unmukt Chand is an young Indian cricketer, who lead the Indian U19 team on "2012 U-19 Cricket World Cup" to get World Champions title. He plays for Delhi Daredevils IPL team as well. 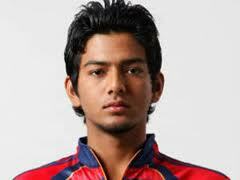 Unmukt Chand born on 26th march 1993 in Delhi, the capital of India. His father Mr.Bharat Chand Thakur, a teacher and his mother name is Rajeshwari Chand. He did his schooling in Delhi Public School and Modern School. Mr.Sunder Chand Thakur, Unmukt Chand's uncle motivate him into cricket. He plays cricket for L.B. Shastri Club located in Delhi. Mr.Sanjay Bhardwaj, coach of Gautam Gambhir trained him as coach. As he performed well in club matches, he get chance on Ranji Team. He got selected on Delhi Ranji squad and scored a century and 2 half centuries in 2010 - 2011 Ranji Trophy. As he performed good in Ranji he become the captain of "The India U19 Cricket Team". He led the U19 Indian time to win World Champions title under his captaincy. On 26th August 2012, Indian U19 team beat Australia and won "U19 ICC World Cup 2012" title. He was awarded "Castrol Junior Cricketer of the year", for the year 2011.